The users assign categories to appointments and share their calendars with other users, but many of the other users can’t see the category colors, only the category name, not the color the calendar owner set. How do we fix this? This is a permissions issue. If the other users have the correct permissions on the calendar, they will be able to see the category colors. If they have the same category name in their category list, the appointments should use the color from their category list. Why? Only category names are visible on items when you share folders on Exchange server; category colors are set per user. Other users will see the categories in a white color (unless it's already in their color category list). When looking at the Category master list while the event is selected, the category will be list as 'Not in master list'. Users who have Reviewer level or better permissions on the calendar will see the calendar owner’s category colors. To check the permissions, right click on the calendar (in the Owner’s mailbox) and choose Properties, then Permissions. If you are setting the permissions in Outlook on the web, choose 'Can view all details' or 'Can edit'. To set or check the permissions using Powershell, use the Set-MailboxFolderPermission cmdlet. 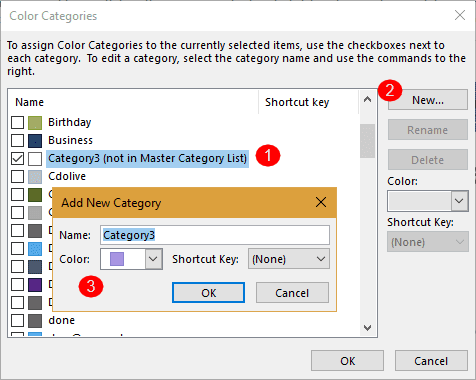 If the user opening a calendar shared with them doesn't have the correct permissions, they can add the Category name to their own Category list to display it with a color.